I recently found a couple scans from JANE magazine, dated June/July 2003 which contained an Anti-Avril article. Below are the scans of the cover of the magazine and the article inside. 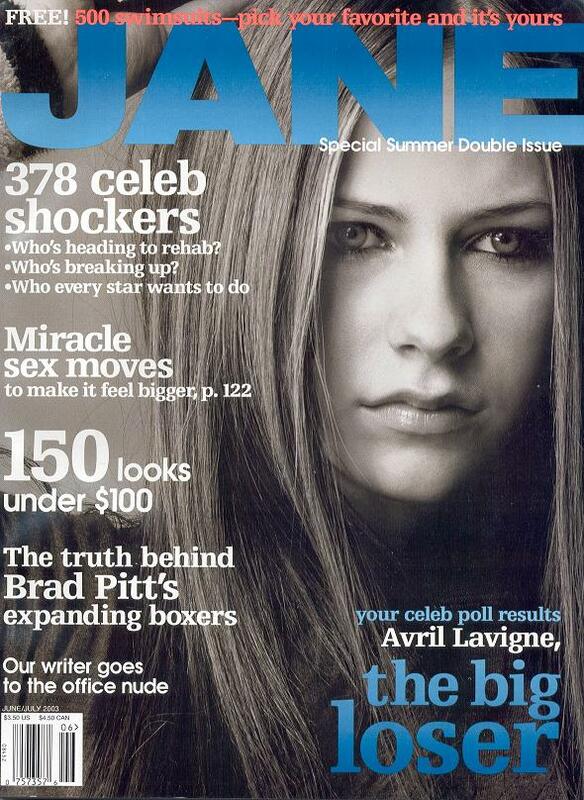 Above is the cover, which reads 'Avril THE BIG LOSER'. How much more true can a statement get? They had a poll and it seems that a majority of JANE readers don't like Avril. Below is the article from the inside of this issue of JANE Magazine. Avri's life could be anybody's dream. At age 16, she was signed by Arista Records for a reported 1.26 million, then recorded a multiplatinum album with three No. 1 singles. But your hatred of her doesn't stem from any weird jealousy. It's her music and style that bug the crap out of you. Not only did you vote Let Go worst CD, but Avril was also the write-in for worst clothes and concert. We've gotten Avril hate letters since she first appeared - most of them having to do with her "punk" look and how totally unpunk she actually is. Natalie from Milwaukie writes "Real punks don't wash their hair and can't afford snowboards." while Bernadette from Toronto is kinder, "Leave Avril alone! She's from Napanee. You have to see Napanee to understand." No offense to our Canadian friends, but we hope we never have to. June 2002: Avril's debut album, Let Go, is released and tops the charts. Chelsea from Berne, NY., says, "She tries to act all tough because she doesn't want to commit to the whole 'pop' thing. But that's the type of music she creates. Let's face it, sweetie, you aren't - ." Amanda in Chicago fumes, "Those ties were ugly back when Diane Keaton wore them in the 70's, and they're stil ugly now. I'd like to tighten one around her puny little neck." Jen from Angel Fire, New Mexico., sums it up best: "The earth shattering tremor heard around the world was the death rattle of musical integrity." Jessica from Toronto writes "Why are you always picking on Avril? That's just mean - a bunch of grown women picking on a little ." "She changed some lyrics," says The Matrix's Scott Spock. Natalie weighs in again: "That CD sure has some insightful lyrics: 'He was a skater boy / she said see you later boy'? She couldn't think of a better word to rhyme with boy than...boy? Joanna of Yellow Springs, Ohio gripes, "Just because you write in your diary with liquid eyeliner does not make your ideas dark and meaningful. There's nothing sadder to the truly sad than to see someone who is not ugly, is not fat and is not lonely pretend to be. You are poor man's Samantha Fox dressed as a Mall Rat version of Siouxsie Sioux." "Avril is a sad little who was kidnapped by evil media marketing s. I pray for her." -Jenny, Monroe, Conn.
"Yannie is more punk than she is." -Kristina, Pekin, Ill. There you have it, folks. A magazine that hates Avril. Maybe now people will see her evil ways and realize that fame means NOTHING!